If you need an experienced personal injury attorney, schedule a free consultation at the Fort Worth, Texas, office location of the Mullen & Mullen Law Firm. Our lawyers will fight for your full and fair compensation for lost wages, medical bills, property damage, and pain and suffering. Additionally, our firm represents clients in wrongful death cases, insurance law cases, diminished value cases and numerous other personal injury cases. 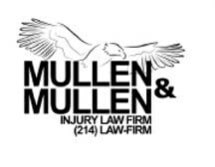 At the Mullen & Mullen Law Firm, our personal injury lawyers understand the devastation a serious accident can lead to. Catastrophic injuries can impact the entire family, placing all family members in financial peril. We will work to negotiate a beneficial settlement with the at-fault party's insurance carrier. If a settlement cannot be reached, we are confident in our ability to represent our clients in court. Trust our firm to fight on your behalf every step of the way.